$20 for a 12oz Pack of Free-Range Eco Naturals Achilles Tendon Chews with Free Shipping! If your dog has a sensitive tummy or bully sticks just don’t last long enough, you’ll want to know more about today’s deal from DoggyLoot! 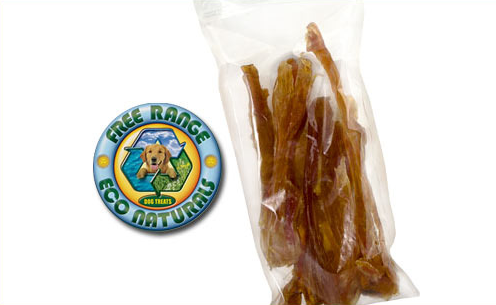 For just $20 including shipping, you’ll get a 12oz pack of Achilles tendon chews from Free Range Eco Naturals. These chews are made from grass-fed, pasture finished cattle raised on ecologically responsible family ranches in the Pampas region of Argentina. Achilles tendon chews contain no added hormones, antibiotics, steroids, pesticides, animal by-products, artificial colors, flavors, or preservatives… they are as close to nature as your pup can get. Free Range Eco Naturals is dedicated to keeping their products as simple and natural as possible, so these chews are made with just ONE ingredient and they are long-lasting, 100% all-natural, and delicious! There’s also a new signup bonus: Join DoggyLoot from this link and Receive a $5 Free Credit good toward your first deal purchase!